Life emerged on earth some four billion years ago. Going forward, life kept diversifying. Evolution has two steps: Genetic mutation and natural selection. Genetic mutation - the trigger for evolution - is random in nature and occurs at some constant rate in organisms. Natural selection that follows favors traits more suited for a given environment. In the test of survival, a complex interplay between organisms and their ever-changing environment determines who are retained and carries the genes deemed preferable to the next generation. A possible tree of life is shown here. Not much had happened for the first few billion years. The branch for algae diverged around 1.5 billion years ago. And, animals and plants started to diverge around 500 million years ago. In the history of green plants dating back some 500 million years, the flowering plants (angiosperms), the most dominant land plants today, appeared on earth some 140 million years ago. 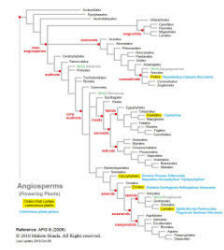 Angiosperms became widespread around 100 million years ago and became dominant 60-70 million years ago, around the time of the demise of dinosaurs. Click here for Tree of Plants.